Yes, that’s right. It’s that time again. Time for found poetry consisting entirely of search terms that were used to find my blog recently. Well? What if the meaning of red dragonfly? Then what? The new issue of Modern Haiku came in the mail the other day, so that was basically all anyone heard from me for the rest of the night. Among other good things there was an essay by Jim Kacian about haiku that are not three lines long. It’s interesting to think about why three lines sometimes works and sometimes doesn’t. It’s interesting that it works so often. The question is whether it works because we make it work — because we think of ourselves as writing three-line poems — or because there is something intrinsically haiku-ish about three lines. I haven’t answered that question to my satisfaction yet. There’s so much good stuff in Modern Haiku. I gave a little talk this week at the university here about the history of English-language haiku (which was a blast, partly because I had a great audience), and I ended up talking a lot about Modern Haiku, because you can’t talk about the history of English-language haiku without talking a lot about Modern Haiku. They’ve been around almost the same amount of time. 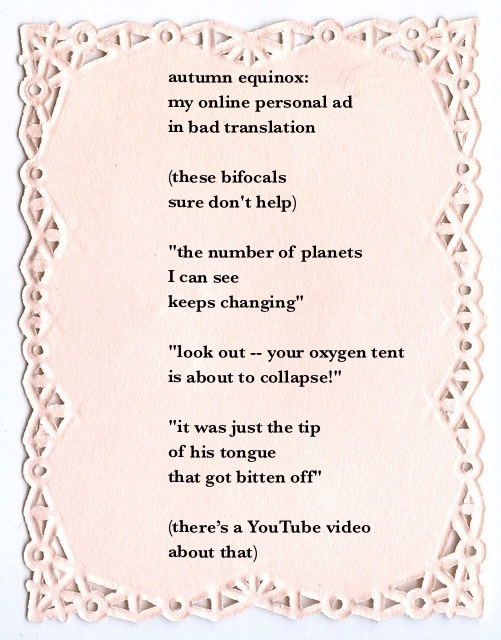 Pretty much everything that is in English-language haiku shows up in Modern Haiku at some point. Here’s some of what I liked the most this time around.